Westwide SNOTEL basin-filled map January 2, 2019 via the NRCS. Ten days and several nights of snowstorms in the past 51 days has put Cortez above normal snowfall for the 2018-19 winter season. But because of an abnormally dry 2017-18 winter, Southwest Colorado remains in the worst drought category of “exceptional,” according to the U.S. Drought Monitor. Since the beginning of the winter season on Nov. 1, Cortez has received 23.6 inches of snowfall, Andrus said. The average winter snowfall through January is 21.2 inches of snowfall, so Cortez is already at 111 percent of normal as of Jan. 2. An El Niño weather pattern, indicated by increasing Equatorial Pacific temperatures, is developing and increasing the probability that winter storms will continue to track more south and hit the Four Corners area. In the Dolores Basin of the San Juan Mountains, snowpack is at 84 percent of average as of Jan. 2, according to Snotel devices that measure snowfall at different elevations. A dry November contributed to the below-average tally. Last year at this time, the Dolores Basin snowpack was just 26 percent of average, and ended the winter season at 50 percent of average, according to Snotel reports. Last year was a drier La Niña weather pattern, indicated by cooling Equatorial Pacific temperatures, which increases probability that winter storms will take a more northerly route that miss the Four Corners area. The Four Corners and Southwest Colorado remain in the worst category of exceptional drought, according to the U.S. Drought Monitor’s latest posting, on Dec. 25. But the area of exceptional drought has been shrinking the past two months. With consistent snowfall on New Year’s Eve and New Year’s Day, local snowpack levels, as of Jan. 2, have shown an 8 percent increase since last week, according to data from the Natural Resources Conservation Services (NRCS). The San Miguel, Dolores, Animas and San Juan River basins are currently 71 percent of median, up from 63 percent of median last week. The Upper Rio Grande Basin has also seen an increase in levels, with a current total of 76 percent of median, compared to last week’s total of 67 percent of median. 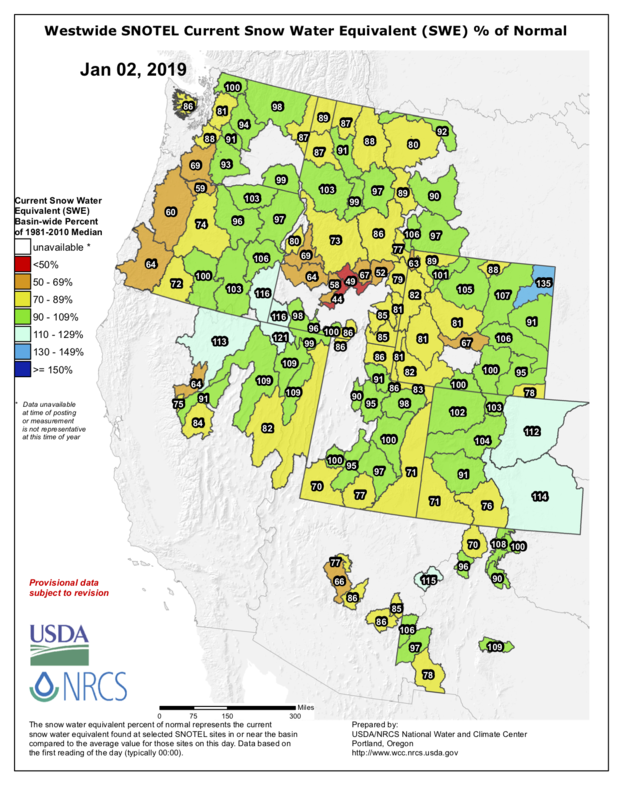 Snowpack levels remain the same for the Gunnison River Basin, staying at 91 percent of median. The Yampa and White River basins saw a drop from last week, going from 110 percent of median to 102 percent of median this week. Another fall in snowpack levels is recorded at the Laramie and North Platte basins, with current levels sitting at 103 percent of median, compared to last week’s total of 108 percent of median. For the Upper Colorado River Basin, snowpack levels are 104 percent of median, when last week they were 112 percent of median. The South Platte River Basin saw a drop in its snowpack levels as well, going from 118 percent of median to 112 percent of median. Rounding out the snowpack totals, the Arkansas River Basin sits at 114 percent of median, when last week that total was 110 percent of median. We also see an increase in individual snowpack levels for the Wolf Creek summit. This week, the summit is 74 percent of the Jan. 2 median and 31 percent of the median peak. Last week, the Wolf Creek summit was 66 percent of peak and 25 percent of median peak. However, locally, the National Weather Service (NWS) does not predict a chance of snow until Sunday, with a “slight chance” of snow showers that day. For Wolf Creek Pass, the NWS indicates a 20 percent chance of snowfall on Saturday night and a 50 percent chance of snow on Sunday. “I feel better, absolutely. But, we’re still not where we want to be,” NRCS District Conservationist Jerry Archuleta explained.